Advertising Design ideas : Noelia Lozano is an Art director and Graphic designer from Spain. She has an amazing group of experienced help who understand her flavor of art in the advertisement industry. 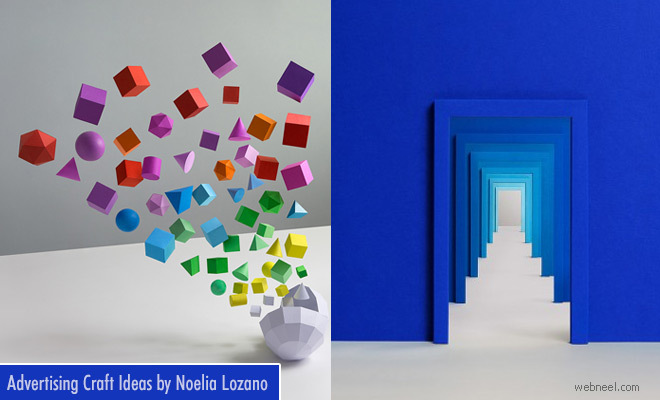 According to her website,"Her work is focused on papercrafts, CGI and set design- often combining these different techniques and materials to create boldly visual and colorful tactile imagery on three dimensions. With an emphasis on process, she loves highlighting textures, color, light, shadows, and shapes". Did you know that Noelia holds a degree in telecommunications and computer systems and has also worked as a draftsman in the engineering industry? Well, she left all this behind to pursue her true passion: Graphic design. She is a freelance graphic designer whose work is appreciated worldwide. Her works have been published in various print and online media, including Computer Arts, Indexbook and others.